Over 200 women and men from all over the world gathered this week in Thimphu, Bhutan to set new agendas for gender-positive change in natural resource management in rapidly changing mountain contexts. A decade following the success of the ‘Celebrating Mountain Women’ conference in 2002, participants at the Bhutan+10 Conference reflected on gains, innovations, and best practices, as well as the persistent challenges and resistance that continue to face mountain women in achieving gender equality in the region and beyond. The energetic international conference, co-organized by the Kathmandu-based International Centre for Integrated Mountain Development (ICIMOD), the National Commission for Women and Children, Bhutan, and the Ministry of Agriculture and Forests, Bhutan, encompassed an action-packed agenda from its opening on Sunday 14 October to its closing on Friday 19 October. The conference was deeply honoured by the presence of Her Royal Highness Princess Chimi Yangzom Wangchuck, who delivered the closing keynote address. Her Royal Highness also attended the Celebrating Mountain Women conference in 2002 and acknowledged that much has been achieved in the past ten years. “It is with the initiative and support led by you that the stories of mountain women are heard and the lives of mountain people are improving”, Her Royal Highness said. “As a mountain woman myself and mother of two mountain boys I look for inspiration to a sustainable future for mountain people from the participants gathered here today. I believe that Bhutan+10 has come up with new agendas and innovative strategies for tackling gender issues and sharing of valuable information on natural resource management and climate change adaptation. We know that this will lead to sustainable development in the mountain region.” The conference was also honoured during the conference opening to have as its chief guest the Honourable Chief Justice of Bhutan Lyonpo Sonam Tobgye of the Supreme Court, Royal Court of Justice. The conference reflected on whether gender ‘mainstreaming’ in institutional programmes has been able to deliver the required levels of gender equality, women’s leadership, in-depth research, and gender-positive impacts. “Due to the fixation on ‘adding women’ to pre-existing structures and other policies that are not equitable, mainstreaming efforts have not been effective in achieving gender equality and women’s meaningful participation in all domains of mountain development and research”, said conference organizer Dr Ritu Verma of ICIMOD. Participants instead called for business as unusual, for out-of-the-box thinking and new strategies for change. A comprehensive new framework for gender-positive change presented at the conference embraces strategies for gender-focused research, strengthening of women’s leadership skills, actionable policy and outreach, and the development of networks and new partnerships across the greater Himalayan region and beyond. The week’s activities included an informative and engaging high-level panel of Ministers from Afghanistan, Bhutan, Norway, and Pakistan, including a debate on the pros and cons of affirmative action and quota systems. A second high-level panel reflected on the outcomes of the United Nations Conference on Sustainable Development (Rio+20) in terms of gender impact. Both panels ended with strong messages renewing the focus on gender equality. Six plenaries and eighteen parallel sessions brought together senior experts, researchers, policy makers, and grassroots practitioners on gender and natural resource management from around the world to reflect, debate, and develop new strategies on gender issues in areas such as livelihoods, climate change, governance, ecosystems, and water and hazard management. The conference provided a vital networking opportunity where new friendships, linkages, and bilateral relations were forged that will last into the next decade. Many participants gained new innovative ways of thinking, strategizing, and acting collectively on gender issues in mountain contexts. 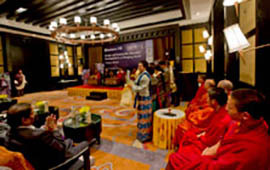 An important report on women’s participation in the 2011 national elections in Bhutan and the ICIMOD study ‘Gender and Biodiversity Management in the Greater Himalayas’ were launched on the opening day of the conference. Women environment leaders were interviewed for an upcoming video to inspire future generations of girls and women. Most importantly, the conference ended with the announcement of an important new global network on Women, Gender, Environment and Mountains (WGEM) which will ensure that researchers, practitioners, policy makers, and grassroots women are connected on a regular basis, both virtually and through regular face-to-face meetings. The Bhutan+10 conference declaration, launched by the Honourable Lyonpo Thakur S. Powdyel, Minister of Education and Chair of the National Commission for Women and Children, Bhutan, calls for better integration of mountain perspectives in all sectors and scales of international development, sufficient human and financial resources for gender analysis and transformative change, affirmative action, recognition of women and men as active players on a level playing field, and the promotion of wellbeing and happiness in mountain countries.